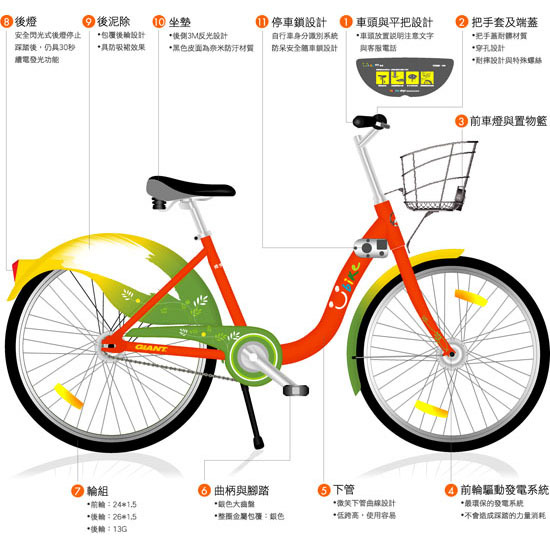 Here's what the bike share bicycles in Taipei, Taiwan look like. With so many cities around the world now enjoying bike share programmes, it's interesting to consider how few have 'gone crazy' with the paintjob. Paris is beige, London is blue, etc. But the YouBike in Taipei is a splash of colour on the urban landscape. The bikes use and RFID system, have dynamo-run lights and they are free for the first 30 minutes. Afterthat it costs $10 per 15 minutes, but that's Taiwanese New Dollars, ten of which translate to only 33 cents. There are 500 bicycles to begin with and 11 docking stations featuring 718 docks, plus one service centre. It is run by the City and a bike brand called Giant.